Magma Mobile is a French game studio with a large advertising monetized audience who enjoy fun casual games. They've worked on 150+ apps and games, and have over 476+ million downloads in total. Many of their games are small, bite-size experiences with an APK under 10MB, enabling the studio to create instant versions, with instant apps, that are identical to their installed counterparts. Magma implemented instant apps as they saw potential to more effectively cross-promote games and yield higher conversion rates compared to their previous versions. 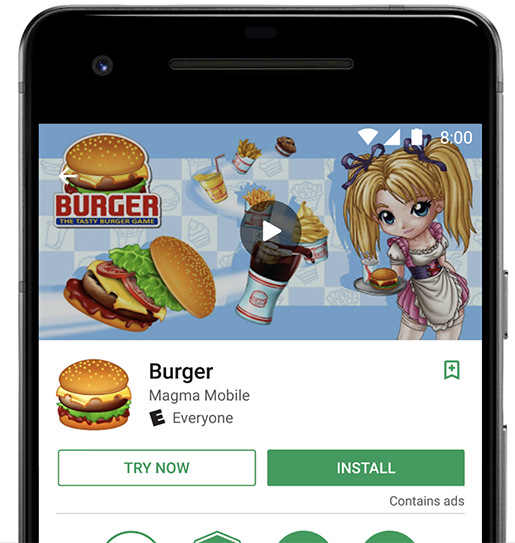 They therefore decided to build and launch an instant version of Burger, a time management game to flip burgers, which is available by clicking "Try Now" on its Play Store listing. They were able to create the instant version of Burger in less than two weeks, and they were able to port the Burger experience fully intact to the instant format without removing any features or levels. After making tweaks to their proprietary game framework to support the Burger instant app, Magma Mobile was able to convert Mouse, a simple but very addictive puzzle game and Words, an addictive word game, in a matter of days. Instant apps allowed Magma Mobile to onboard new players quickly and monetize larger audiences through advertising, all with minimum development effort. "Cross promotion of titles is essential to maintaining a critical mass of users within our platform to drive ads revenue. We believe instant apps will materially improve the effectiveness of our cross promotion strategy and drive substantial business uplift."